White and Gold vs Blue and Black – And the Truth Is… | ASTRALCOM - Content Strategy, Conversion Marketing and Customer Acquisition. By now, you’ve heard all about the famous dress that blew up the Internet. Is it white and gold or is it blue and black? 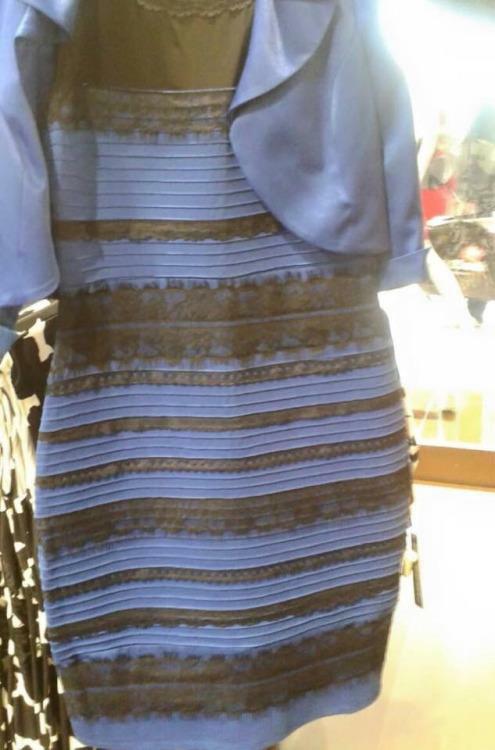 The dress, in fact, isn’t even any color. It’s simply reflecting the light of the color spectrum. The light (color) coming into your eyes. I know this is difficult to grasp. Imagine what our designers face when working with colors in creating logos, images, adverts and social memes. Color breakdowns using CMYK, RGB, Pantone, etc are all slightly different ad then so is your eye. Yahoo Tech does a good job of going the various myths and the ultimate truth. They blame it on the context of color. That is, “Color-extraction theory says that our brains correct color according to the visual context.” So, the color of things (cars, shoes, grass, your company logo, products – everything) and how they are observed are just a reflections of light waves going into your eyes. This unique effect is produced by these specific colors, in this specific lighting and how it was captured by this photograph. The dress was _________ & ___________.